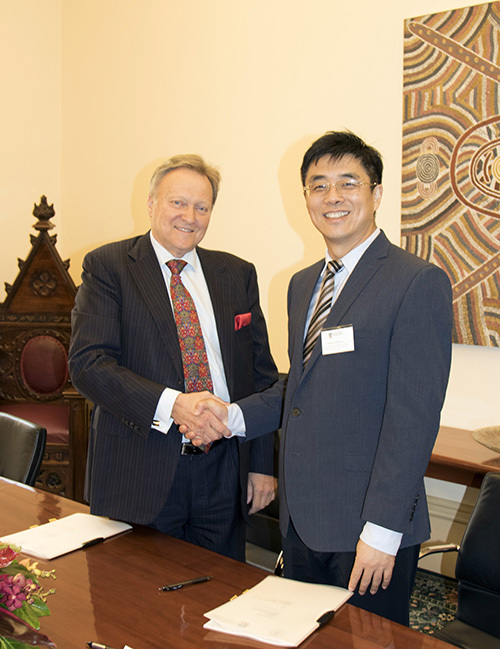 The University of Adelaide has signed a new undergraduate articulation agreement with one of its most strategically important international partners, Dongbei University of Finance and Economics (DUFE) in China. 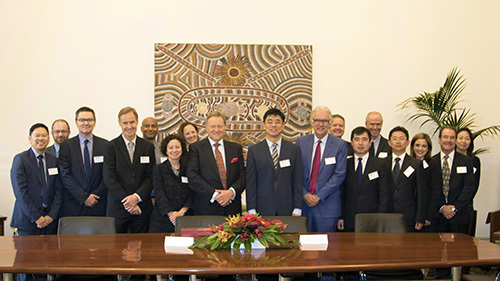 Vice-Chancellor of The University of Adelaide, Professor Warren Bebbington and Professor Christopher Findlay, Executive Dean of the Faculty of Professions welcomed dignitaries including Professor Charles Zhao, Dean of DUFE’s International Business College early last month. In the 15 years since the original agreement was signed, over 700 students from DUFE have joined The University of Adelaide’s undergraduate and masters programs. In addition, the relationship has seen the exchange of teaching staff to and from both institutions. The new articulation agreement’s signing marks the next step in a strong, long standing relationship between the two institutions. The agreement provides opportunities for DUFE students, to transfer into Adelaide’s Bachelor of Commerce, Bachelor of Finance and Bachelor of Economics. This entry was posted in News and tagged DUFE. Bookmark the permalink.